How patient are you when it comes to getting what you want? I’ve always struggled a bit with this, because while I’m a planner, I also tend to lose motivation when results seem a long way off. My favorite scene in movies is the montage where the hero or heroine is working towards their goal, and within a matter of minutes, they’ve gone from flab to fab. It’s just so satisfying, isn’t it? But real life doesn’t work like that, and trying to stick to your goals when the going is long can be tough. For me, this is more of an issue when it comes to spending than saving. I don’t mind waiting for savings to add up–every little bit is encouraging to me, maybe because I don’t have one big goal in mind for our savings. I know I would like to have a house one day (or at least a bigger apartment) but I haven’t sat down and calculated out exactly how much it would cost; it just seems too big of a goal. Houses is our area are pricey, so we’d be looking at almost double our current mortgage just to get a small fixer-upper. But those smaller, spur-of-the-moment purchases can be hard for me to resist. I have a trick I play on myself, where I’ll pick up something I’m interested in buying. During the rest of my visit to the store, I’ll carry that item around with me, as if it were already mine. Generally, by the time I finally make it to the register, I’ve talked myself out of buying it. This is particularly effective when it comes to clothes, which I won’t allow myself to buy without trying on. If I don’t have the patience to wait in line for the dressing room, to try it for fit and look, then wait in line again to buy it–well, is it really worth it? Sometimes my lack of patience can work in my favor, frugally speaking. When there’s something that I want that costs more than 20â‚¬, I generally give myself a longer “waiting” period before I’ll buy it. There’s a local clothing store that I really like, but its prices tend to be a bit out of my budget. Because I’m a “fan” (or is it only that I “like” them now?) on facebook, I get messages about deals they are having. For our French Mother’s Day, which was last weekend, they had a special flash sale–any item for 40% off and free shipping. How can you beat that? So, in honor of the day, I treated myself to a cute summer dress that I’d be wanting, but for which I’d balked at the price tag. My patience in this instance saved me over 30â‚¬. One of the most important things that helps me stay frugal is knowing my own strengths and weaknesses, and knowing how to put them to work for me rather than against me. I still struggle with patience in all areas of my life, but it’s something I make a conscious effort to cultivate. What about you? 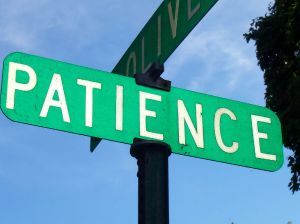 How much does patience play a role in your financial life? What tips and tricks do you have for being patient when it comes to achieving your goals? I am not very patient – yet – but my level of patience is increasing. I never thought we would be disciplined to get a $1000 emergency fund, put it in the bank and not touch it. Never. But it’s there. In January, when I sat looking at my bills and realized that we had 18 debts, exclusive of our house, car and home equity loan, I never dreamed that we would be down to only five left by June, yet here we are. I think if I was very patient, I would not be as persistent about getting out of debt. So it’s working for me. There has to be a balance to it. Sometimes a little impatience is good. And when it comes to the shopping — I made a small card with our remaining debt on it and put clear packing tape on it to “laminate” it and carry it with my debit card, cash and checkbook. I am not spending without coming face to face with out remaining battle. .-= JanB´s last blog ..Lowes, Lowes, You Gotta Go. =-. I dream of being able to travel extensively in a few years and in order for that to happen i have to be debt free & clutter free. So that is why i can have patience when it comes to buying more stuff. When i see something i want now i just remind myself that there is so much to be had in the future if i will just wait a little longer. I’m a bit surprised that you are able to carry the item around the store with you and still manage to talk yourself out of it. Years ago, I had read about a study where the researchers found that shoppers are more likely to buy items, whether or not they are needed, if they are able to handle the item for as long as they want before deciding whether or not to purchase. I think the researchers had decided it had something to do with people starting to identify the item as theirs the longer they held/examined it and then, more often chose to purchase the item as they had already started developing an attachment to the item. Their recommendation to the store who had hired them (to find ways to entice people to shop) was to make sure there were plenty of display items around and that people were encouraged to touch merchandise (for ex, a salesperson would go over and point out features using the display model). When I read that, I made it a point to stop picking things up in stores unless it was something I had gone to buy and noticed that my shopping became more focused. I could still browse through stores but items didn’t seem as purchase-worthy when I wasn’t allowing myself to pick them up until after determining if I really needed the item. You must have amazing willpower to be able to carry something through the store with you and still be able to not get it!! .-= [email protected]´s last blog ..Food Stamp Challenge =-. That’s an interesting point, Kris. I can see how that would be true for people who like to hang on to stuff, but I tend to be just the opposite–the longer I’ve had it, the less I want it. Of course, there are exceptions to this, but I just don’t collect stuff. I’m one of those people who fantasizes about giving away everything and living out of a camper van (are there actually other people like that?). So if i carry it around the store, I have the time to really evaluate it, and usually I can talk myself out of needing/wanting it. Whereas if I just see it and walk away, I’ll continually ask myself–was that as great as I think it was? I should go back and have another look! And I’ll obsess about it until I go back and get it. Maybe I’m not typical in this, but again I think it comes down to knowing your strengths and weaknesses, so you can do what works for you. If not touching is effective in getting you to avoid impulse spending, then of course you should stick to that! I actually do this a lot too- carrying it around gives me the chance to really evaluate it. This is similar to using a shopping basket instead of a cart when you go shopping- you can carry less stuff, and so buy less.